20 cm 121p : ill. Originally published: U.S.: Scholastic, 1997. 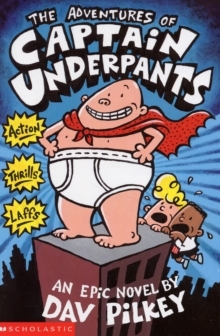 When naughty George and Harold hypnotise their headteacher, they accidentally create the greatest superhero in the history of their school -- Captain Underpants! His true identity is so secret that even HE doesn't know who he is...but he's fighting for truth, justice, and all things pre-shrunk and cottony!! If you're a naughty villain like the diabolical Dr Diaper, watch out!